Welcome back to our money saving linky, we try to find the best deals and share how we have saved money in the previous week. I have really been trying to cut down my incidental spending and I am doing well. 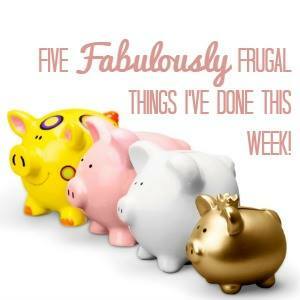 This week I have saved and made money in a number of ways. First up I have given Dylan (my 14yr old) the responsibility of selling the stuff in the garage. I have been meaning to get things listed for a while but just ran out of time. We have agreed a percentage of sales will be Dylan’s. This way I have made some money, cleared some space but it hasn’t been a drain on my time. I am collaborating with Buy A Gift on a great campaign and they have an offer on their Fathers Day range which gives a 25% discount. You can also enter to win an experience worth £150 over on Emma and 3, click to be taken to the competition page on Emma and 3. Many of us enjoy a cheeky cocktail or two, but they can soon get expensive. Unless of course, you make them at home and drink in the garden. This week I shared a roundup of 12 Prosecco Cocktails to Make This Summer. I have got a cleaner, now this might not seem money saving initially but as a freelancer, I can earn more in the time it would take me to clean. Plus I just don’t enjoy it! Therefore I am playing to my strengths! Getting a cleaner is also on my list of things to do. I know it would free up so much of my time to work but I haven’t plucked up the courage to hand it over yet. I think I may be a bit of a control freak haha. Love that you have got a cleaner! Totally effective delegation! Am book marking the cocktail posts!